How can sales managers consistently pick winners? Read on to learn from Olympic kayaker and retired Olympic swimming coach, Bill Jewell as he shares his insights from working with top swimmers. He demanded these eight characteristics from his athletes. They parallel what sales managers must insist on from sales professionals to have a consistently winning team. Use these ideas and questions as a checklist next time you need to hire a superstar sales pro. Disclamer: Check with your HR department before asking these questions as they may unintentionally violate certain local laws or company policies. Olympic medalists possess extraordinary physical strength that powers them to their success. Without this strength, they can’t even start in the field of the world’s best athletes much less have stamina to make it to the end of the race. Sales champions possess physical strength because they must be able to have the stamina to have long days, endure the challenges of a road warrior, and finish with enough energy to be present with their family when the day ends. Sales managers look for sales champions who are physically fit so that their health never interferes with their performance and in fact, amplifies their sales outcomes. Ask, “Let’s hit the gym and do a few circuits” to see how they respond. Ask, “What do you like for our meal together?” The answer is telling. Olympic champions train intensely. They aren’t afraid of hard work, sweat, or personal discomfort. They engage in the training that their coach prescribes without complaint or hesitation because they know it’s how they get to their goal. Sales champions train intensely. They continuously drill on their product knowledge, the competitor’s products, and likely sales scenarios. No matter how long they’ve been selling, they still always willing to learn and grow every day because they know that they’ll get left behind if they don’t. Sales managers select sales champions that exhibit personal growth and are committed to honing their skills. They look for people who invest in themselves and don’t rely on their bosses to become better. Olympic competitors use all of their assets: physical strength, mental focus, emotional drive, spiritual connection, environmental advantages, and every part of of their support structures. Instead of lamenting what’s missing, they focus on maximizing their assets: developing what’s weak, exploiting what’s strong. Sales managers choose team members who are resourceful, using all of the available assets, developing where they need more strength and sharing with the team where they have an abundance of ability and knowledge. As long as the fundamentals are there—positive attitude, focused energy, practical intelligence, and a hungry willingness to learn—sales managers can develop the rest of the necessary sales skills. Nothing intimidates an Olympian. Nothing! They have no fear of prolonged pain, antagonistic competition, rigorous coaching, new situations, unknown territory, or untried methods. They courageously move into battle knowing they are at their best and that preparation and willpower ensures their success. Top sales managers select sales pros who can confront with unflinching confidence the toughest buyer, the meanest negotiator, or the strongest competitor. They choose team members who cheerfully cold call, deftly deal with angry customers, and fiercely fight for their customer without fear for their career. Ask, “Think of a time when your customer tried to intimidate you, such as saying, ‘If you can’t give me a better price, get the Hell out of here!’ What did you do?” Their answer is very telling. Olympic champions tough out what’s necessary to win the prize. They pull from inner strength to get through situations that crush lesser mortals. If giving their last erg of energy breaks the finish-line tape, that’s what they do. Sales managers demand this characteristic from their superstars. Sales is a tough business demanding tough sales people to take on rough territories and seemingly overwhelming competition. Winning sales pros know their power and are never bullied by customers into relinquishing that power by unnecessarily giving up margin or letting prospects berate their products. If their toughest experience doesn’t match the current sales challenges, move on to someone who has the strength to take it. Olympians hate to lose. Missing a medal breaks their heart and spurs them to be better. Every Olympian has lost a heat and yet they turn that loss into fuel to win the next race. They know that every loss is their fault and won’t make excuses. Sales managers choose team members who passionately hate to lose. Top sales pros will do almost anything to keep from losing. And when they do lose, they learn from the experience instead of blaming others. If you have a team member with continuous excuses for losing, cut them loose, now! The answers give you an insight into how they’ll approach your critical customers. Winners take responsibility for losing deals and grow their skills from the experience. All Olympians wish for greatness. They believe that they have what it takes and commit to do what it takes to express their greatness. When the difference between gold and bronze is hundredths of a second, the athlete who holds their dream closest and does everything—absolutely everything within their power—to achieve their dream, wins. They make their dream come true. Sales managers know that discipline is the secret to greatness. Commitment to be a great sales professional and the discipline to make it happen creates extraordinary sales outcomes. Ask, “Thinking about you being a sales professional, how would you describe yourself?” If they respond, “Average,” run! If they answer, “I’m one of the best,” ask, “On a scale of one to ten, how committed are you to being a top sales professional?” If it’s not ten, run! Olympians always finish. Next time you watch the Olympics, notice that they don’t quit. Even if they aren’t in the medals, they always finish. Champions are devoted to their personal quest and don’t stop just because they can’t win this race. If you’ve got sales people who say, “I know that they aren’t going to buy from us,” they don’t know how to sell. Sales happen when customers don’t want to buy from you. Otherwise, it’s just order taking. Sales is about coming to agreement and pros stay with it, creating agreement after agreement until the sale happens. Ask, “What do you do when it looks like a competitor is going to get the deal?” You’ll know what to do with the answer. This entry was posted in Uncategorized on May 11, 2012 by Mark Smith. If you’re like most sales professionals, customers take their sweet time to place orders. Even though they clearly have a need, it seems that it takes awhile for them to pull the trigger on the deal. Read on to learn three ways that you can accelerate your sales, speeding deals to close faster. Deadlines drive all deals. Customer must have some compelling motivation for them to move forward. There are two types of deadlines, internal and external. An internal deadline is one that your customer must meet or there are unwanted consequences. For example, if they don’t buy more disc space, they’ll run out in the next month. And if they run out, the system shuts down. The sales person imposes an external deadline and it always results in loss of margin. For example, “If you buy before the end of the month, I’ll knock off ten percent.” You have to give something away with an external deadline. The secret to accelerating deals: Look for internal deadlines to determine what deals will close the fastest. Make sure that you watch that deadline and understand with missing the deadline means. Any deal that you have on your sales forecast must have an identified internal deadline with the associated consequences. If it doesn’t have a deadline, it’s not a forecast, it’s fortune telling. Calculate the customer’s cost of delaying the deal. If your offering saves them operating costs, reduces expensive labor, or decreases waste, make sure that the people who care about these wastes and losses know the costs of waiting. Often your vendor or manufacturer can help you with these calculations. If they have calculators for return on investment (ROI) or total cost of ownership (TCO), you can compute the cost of waiting by examining at the cash flow savings and turning them into monthly figures. For example, if you calculate a five-year TCO, divide by 60 the difference between the costs of their current solution and your offering to come up with the monthly cost savings. If it’s a three-year TCO, divide by 36. It could be that there will be a price increase or a special offer expires. If they order now, they avoid the higher cost. This could be substantial. Or it might be that they’ll miss a deadline that costs them a missed opportunity, they’ll be fined, or pay a penalty. Perhaps they can discontinue expensive overtime or end a contract with an expensive consultant. All of these could be compelling events that triggers the deal. The secret to accelerating deals: make sure that your customer knows the cost of waiting and the impact on their organization and their career. What is the Value of Moving Forward? The value of moving forward becomes the other side of the cost coin. What benefits does your customer enjoy when they agree to the deal? Who most cares about these benefits? That’s the person who needs to know about the value of moving forward. Identify the new benefits that your customer gains. It could be that processes become more efficient. Perhaps they can take tap new resources. Maybe they’ll be more competitive because they can sell their offering at a lower price and still retain their profits. Think about it this way; the cost of waiting is the least they should pay for your offering and the value of moving forward is the most they should pay. Between those two values lies the defensible budget range. If they didn’t have that defensible budget before, they do now. The secret to accelerating deals: make sure that everyone in your customer’s organization knows the value of moving forward, and watch that deal pop loose. This entry was posted in Uncategorized and tagged Closing sales fast, sales tips on April 27, 2012 by Mark Smith. What are the characteristics of a winner whether in sales or in swimming? Read on to learn from Olympic kayaker and retired Olympic swimming coach, Bill Jewell as he shares his insights from working with top swimmers and how seven characteristics of these winners parallels the seven characteristics of top sales professionals. Olympic winners always choose a good life style that focuses on their health, well being, and positive mental attitude. They avoid any behavior that can limit their success, including poor food choices, poor attitudes, and negative influences. Sales winners understand that a good life style supports their sharp thinking and physical endurance to be a tough competitor. The choose healthy meals, positive attitudes, and forward-looking influences. What adjustments do you need to make to your lifestyle to be a consistent winner? Olympic champions are born competitors. They hate to lose and will do anything within their power to win the game. They are always sizing up the competition and making adjustments to their approach to stay on top. Sales champions step into the competition with excitement and enthusiasm. They act like born competitors. They know the competitors strengths and weakness so that they can minimize the strengths and take advantage of the weaknesses. What do you need to do to become more competitive? Olympic athletes are never intimidated by their competitors. They expect for their opponents to be aggressive and challenge them; it’s part of the game. They often play their own mind games with their competitors. Remember six-time gold medalist, Amy Van Dyken spitting in her competitor’s lane before the sprints in Sydney? Harmless, but intimidating. Sales professionals aren’t intimidated by their competitors. In sales, the competition can be quite fierce and sometimes quite vicious; it’s part of the sales game. What do you need to do to not ever be intimidated by your competitors? Olympic superstars continuously train. In the world of the Olympics, the difference between a gold medal and no medal can be hundredths of a second. Any physical, mental, emotional, and spiritual edge can make the winning difference. So training never stops. Sales superstars always train and practice. They rehearse their sales presentations until they are flawless. They practice managing objections until they become second nature. They practice executive conversations until they can talk like a peer. What do you need to practice to improve your ability to be a sales superstar? Olympic medalists perform consistently. They don’t have bad days. Now, some days are better than others, yet they show up for every meet, every practice, and every competition prepared, ready to go, with no excuses. They always race at their best and it shows. Sales winners consistently perform. Like the winning Olympians, they never have a bad day. They always do what’s necessary to meet their quotas month after month. They are always at their best and their customers count on it, refusing to do business with any body else. Top Olympians have mastered the strategy of their sport. They know exactly how to plan and then use technique and tactics to bring home the gold. As the game develops, they continue to adapt and adopt to stay the leader of the pack. Top sales professionals have mastered sales strategies. They know that the average sales person has a bag of tricks but few strategies. Pros adapt and adopt as market conditions change and as competitors try new things. What do you need to do to improve your strategic mastery? Olympic winners continuously seek knowledge in their game. They read about their competitors. They study videos. They seek out research that can enhance their performance. They never stop looking for every way possible to be the best in the world. Sales winners continuously seek sales and competitive knowledge to be at the top of their industry. They study the competition. They study sales training. They study their products. They look for every way possible to be the best in their business. What do you need to do to continuously learn? And so take the next step in your career development. Get immediately free access to a one-hour telecast playback on supercharging your sales career at SalesSuperCharger.com. You can download the telecast to listen on your mp3 player or listen on line. You also get a downloadable PDF sales action guide with more resources. Go there now to access free ideas you can use immediately. Thanks to Bill Jewell for the inspiration. This entry was posted in Uncategorized on March 29, 2012 by Mark Smith. As a sales professional who makes calls on prospects and customers, you know you’ve got to be on time. Yet being on time isn’t enough. Read on to learn about the on-time rule of sales calls because running late doesn’t count as exercise. Your prospect watches your behavior to decide if they can trust you with their business. Your punctuality for appointments is part of what they look for. They’ll make the assumption that if you’re late to a sales appointment, you’ll probably slip your delivery. They’ll assume that if you make excuses for your tardiness, that you’ll make excuses for missing other deadlines. So you better be early to be on time because if you’re on time, you’ll be late. There are always unforeseen circumstances beyond your control that can make you late. It could be an accident, a problem with your car, need to get gasoline, a delayed train, a missed exit, or unexpected traffic. I’m always amazed when a sales professional arrives late and blames the traffic. Is this the first time that they’ve driven in this town? Don’t they know the traffic patterns? Are they such a rookie that they can’t give themselves enough time to account for traffic snarls? Does this mean they can’t negotiate the challenges of orders and delivery snafus? If you must make excuses, blame anything but the traffic or you’ll look lame. “My last customer appointment went long because they had an emergency. I’ll do the same for you.” I don’t encourage lying, yet you need better excuses. Better yet, just plan to arrive early. While most sales people call to let their customer know that they’re running late, this running-early call gets you ahead in four ways. First, you let your prospect know that you are better than on time. Second, you might get a prime parking spot. Third, you’ll likely find them waiting for you as you arrive while the rest of the sales people in the waiting area are cooling their heels looking like their about to get a root canal. And fourth, you might get an extra ten minutes of face time; always a bonus. When you can be better than on-time, you’ll always improve your sales success, putting you ahead of your competitors. And you can learn other ways to position yourself ahead of other sales people. Get immediately free access to a one-hour telecast playback on supercharging your sales career at SalesSuperCharger.com. You can download the telecast to listen on your mp3 player or listen on line. You also get a downloadable PDF sales action guide with more resources. Go there now to access free ideas you can use immediately. How can you make your sales calls more impactful? What can you do to make your customer conversation more meaningful and create a strong relationship? Read on to learn how Robert Ciglar uses the concept of “Borrow My Bike” to increase sales at his business. Robert is a computer engineer who has worked for Microsoft, HP, Cisco, and other major companies. He recently decided that he’d rather pursue his passion for the outdoors and joined forces with friends to open a series of bicycle shops called Cult. 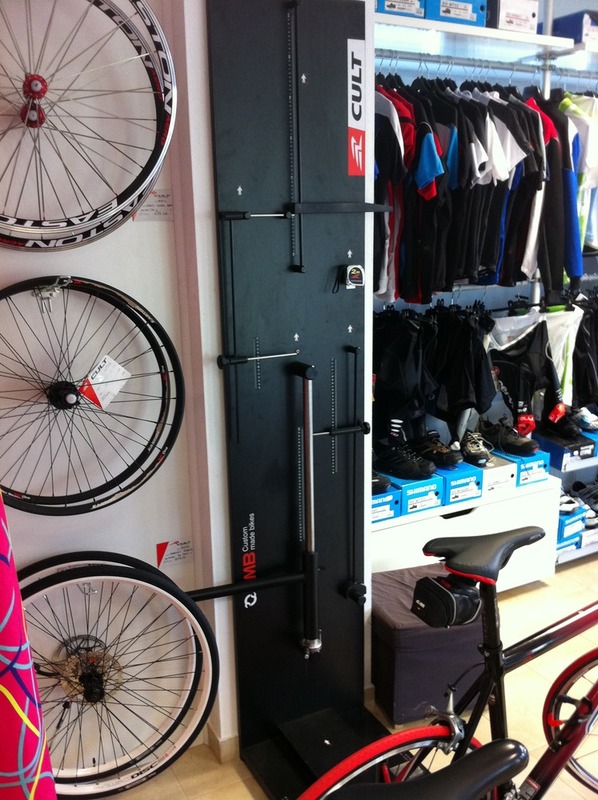 There are lots of competitors in bicycle retailing, so a new shop must have a different twist to create demand and attract customers. Robert uses everything he knows about sales and marketing and applies it to his shops. Here are a few of his unique sales methods. All shop employees have bicycles that they got to purchase at a deep discount. In exchange for that discount, they loan their personal bicycle to prospects. Of course prospects are impressed and flattered that he lets them use his bicycle, creating a better relationship. What can you personally loan to your customers that will increase your relationship? When a prospect asks about an accessory or product, Robert immediately opens the package and hands it to them so that they can inspect it. Since Robert knows that demos sell, he’s confident that customers will buy once they feel comfortable with the quality and functionality. And if they don’t, most products can easily go back in the package or can be sold outside of the package. This is much like sampling, where a customer gets a taste of a product before they buy it. Savvy sales pros know that sampling sells. How can you “open the package” or “do a demo” or use sampling to increase your sales? Robert has special equipment to measure the body dimensions of his prospects. With this information, he can quickly select the correct bicycle and adjust it to fit their unique requirements. This instantly makes the bicycle more comfortable, more functional, and easier to ride. In the process, it becomes very difficult for a prospect to go to another bicycle shop that can’t do this level of customization, eliminating much of his competition. How can you bring a new level of personalization to your sales, eliminating competition and increasing your sales success? Inspired by Robert Ciglar, check out his custom bicycles at Cult.si. And take the next step in your sales career development. Get immediately free access to a one-hour telecast playback on supercharging your sales career at SalesSuperCharger.com. You can download the telecast to listen on your mp3 player or listen on line. You also get a downloadable PDF sales action guide with more resources. Go there now to access free ideas you can use immediately. This entry was posted in Uncategorized on March 28, 2012 by Mark Smith. Struggling sales people put a lot of time and effort into their territory yet seem to have real problems meeting their sales goals. Read on to learn about the three common barriers they face that sales pros do to avoid them. Unbelievably, there are sales people who don’t know their products inside and out, forwards and backwards. I’m always shocked when I ask a sales person about product a detail that I think would be important and they don’t know the answer. It’s even more unbelievable when they don’t know how to get me the answer. I’ll just buy somewhere else, thank you. You may have had the same experience at a restaurant when you asked the server about a dish and they’ve never tasted it and can’t tell you about it. Sales superstars know their product. It’s easy to do! Get every bit of sales literature about your products and read them over and over again. It takes an average of four passes through the literature for you to remember what you need to know. So stick with it. Learn who in your company is the expert on your products. Ask them lots and lots of questions. Learn why the product developers designed the features the way that they did. The more you know about your products, the more of them you can sell. Have you ever asked a sales person, “So how does this stack up against your competition?” and they reply with, “You’ll have to ask them.” That’s not a sales person, that’s an anti-sales person. They are pushing deals to the competition. Sales superstars learn about competitors’ products. In fact, they know as much about competing products as they do their own product. It’s easy. Go to their website. Ask them to send you sales information. Play with the products every time you can. The real professional’s secret is to initially look at competitive product like you were genuinely interested in buying them. You’ll learn why customers choose competitive products. Later look for flaws to better find ways to present your products in a more favorable way. Each customer is motivated by slightly different things. Sales people who struggle believe that the same thing motivates all customers so they use the same approach to each customer. They begin by discussing their product. Do that and you’ll always struggle. It’s probably because they’ve been taught that all customers want to know WIIFM-what’s in it for me. While that is partially true, there is way more to connecting with customer motivation than that. Sales professionals lead with the need and motivators. They first find out why each customer makes the decisions that they do. For some people, they are driven by politics, so they will pick what their boss recommends. Others will choose to minimize risk. Leaders will choose to create new business outcomes and advance their competitive advantage. Financial analysts will select based on return on investment or cash flow improvements. With this information, sales professionals can adjust how they present product capabilities to align with customer motivations and win almost every time. And now take the next step in your career development. Get immediately free access to a one-hour telecast playback on supercharging your IT sales career at SalesSuperCharger.com. You can download the telecast to listen on your mp3 player or listen on line. You also get a downloadable PDF sales action guide with more resources. Go there now to access free ideas you can use immediately. This entry was posted in Uncategorized and tagged selling secrets, selling tips on March 27, 2012 by Mark Smith. Every sales professional wants to become a trusted advisor, someone who customers call when they need help. A trusted advisor delivers solid, valuable advice that shortcuts finding a solution so that the customer can focus on what they do best by letting the sales pro deliver the services they do best. Read on to learn about the Critical Trust Event, the situation that transforms an ordinary sales person into a trusted advisor. What creates trust in your customers? Is it your promises? Is it your guarantee? Is it your customer list? Is it your market share? If you are counting on any of these to create trust, you are sadly mistaken. Customers don’t really trust what you’ve done for others. They only really trust what you’ve done for them in challenging situations. It takes eleven positive events to overcome a single negative event. This means you must build up many positive situations to create trust. Your customers can only trust you after they see personal evidence of trustworthy behavior. This means you have to perform to gain trust. Show up on time: get a trust point. Deliver your proposal on time: gain a trust point. Keep your word: gain a trust point. Be viewed as having integrity: gain a trust point. When you perform to the expectations you set with your customer, you get a trust point. Miss that expectation and you lose eleven points. You can gain many, many points if you can deliver in an emergency. This is a Critical Trust Event. Your customer has to get a new product on line in the next 24 hours. With your help, you can get them back on line. You have tickets to see your favorite band in concert this evening. What do you do? You get to choose. When you create lots of trust in your customers, you become CompetitionProof. This entry was posted in Uncategorized on March 27, 2012 by Mark Smith. As a sales professional, you may be concerned about limited resources provided by your company. You might feel that you need more leads, more prospects, and more sales. Yet your job is to find more customers with the resources you have right now. Read on to learn how to develop your key sales resource. Companies value a sales professional with a resourceful attitude. This means that you are going to use everything within your power to find business, take business away from your competition, and create value with every customer. A slight shift in attitude can take you a long way. Instead of thinking, “I don’t have anything to work with,” make a list of the resources you do have right now. Brainstorming a list of resources can help you get unstuck and out of a sales rut. To get you started here are a few resources to consider. Who Can You Call Today? One of your resources is who you know. I’ll bet that you have at least ten people that you haven’t talked with in the past month that you can check in with. It’s time to do that. His great news is always about the current special, promotion, or new product introduction. He adjusts his message to his customers response so that it’s relevant to what they’re paying attention to right now. What News Can You Share? One of your resources is industry insight. I’ll bet that you could write an article about trends in your industry that your contacts would enjoy reading. You can you take thirty minutes to crank out 300 words about what’s happening in the next six months that your customers need to pay attention to or may miss something important. Make it a white paper. Turn it into a e-newsletter. Put it on your blog. You may wish to review some of my articles to get inspiration on how to do this. Just remember, the first draft won’t be perfect, just get it out of your brain so that you have something to work with. For example, if you’re expecting product shortages (such as disk drives in winter of 2011) let your customers know so that they can plan. If there is an upcoming trade show that customers need to know about, let them know. Perhaps you can offer them free admission to the event. If there are upcoming price increases on products, supplies, or accessories, let your customers know so that they can stock up at the lower price. Put this on your to-do list and let me know what you write about. Who is Happy With You Right Now? One of your resources is satisfied customers. They will remind you of how good you are and can give you a better ego boost than your boss. If you don’t have any customers, call your mother. If they compliment you, say, “Thank you! Who can you think of that can benefit from working with us?” With a bit of luck, you’ll get a referral on the spot. Instant resources! Discover more of your personal resources. Get free immediately access to a telecast playback on supercharging your sales career at SalesSuperCharger.com. You can download the telecast to listen on your mp3 player or listen on line. You also get a downloadable PDF sales action guide. Go there now to access ideas you can use immediately. This entry was posted in Uncategorized and tagged sales attitude, sales resources, sales secrets, sales tips on March 23, 2012 by Mark Smith. Successful sales professionals always work on their skills to keep their career alive. They know that they’ll slip into sales oblivion if they don’t stay fresh and always improving. In this article, you’ll discover how to invest just five minutes a day to intentionally grow your sales skills and stay on top of your sales game. And with this, you’ll be CompetitionProof. Why would you personally want to improve your sales skills? Working on your sales skills makes every sales call more effective, increases the number of deals you do, and helps you keep more margin thus increasing your income. When you use the same old sales approaches or employ the same old tactics when facing a problem, you get the same old results. As customers become savvy about products and solutions, your value as a sales professional decreases over time. This means you must improve your business skills, sales skills, and technical skills if you’re going to increase your value. Until you create a Continuously Active Sales Habit (CASH), schedule time to stop and build your sales skills. This means putting it on your calendar every day for a month, as you build your sales improvement habit. You may want to make this part of your morning routine even before you check email or log into Facebook. Or you may want to make this part of your end of the day routine before you head home or turn on the TV. Choose a time that you can regularly take five minutes and dedicate it to your personal improvement. This could be the most valuable five minutes of the day. There are may things you can do to improve your sales skills in five minutes. Consider the following list and take action right now to improve you skills. Think of a sales challenge that you’re having and search the web for solutions. There are hundreds of thousands of articles about sales skills improvement. Search using the key words of your challenge, such as “keeping more margin” or “overcoming price objections” or “effective cold calling.” You’ll be surprised at the quality of suggestions you will find. Select one or two tactics and immediately try them out. Go to YouTube for example sales scenarios. More and more sales trainers and authors now post video examples of their training and content on YouTube. You can get lots of free ideas from this source. One caveat: make sure that the tactic matches your personality. Some of the more aggressive tactics may not work for you. Some of them don’t work for anybody. Next lunch hour, pull into a book store and buy new sales strategy book. Thumb through the book and make sure that it looks interesting and can address some of your sales challenges. Don’t read the book cover to cover, instead flip around until you find a chapter or paragraph heading that catches your attention. Read that, and if it seems attractive to you, put it into action immediately. This $20 investment could pay off this afternoon. You can also review your existing library of sales books to refresh and renew material you’ve covered in the past. If you’re a seasoned sales professional, odds are good that you’ve forgotten some of the really great ideas that worked for you in the past. All it takes is five minutes to remember a great tactic that can solve an immediate problem. This entry was posted in Uncategorized on March 14, 2012 by Mark Smith.